Who we are - Site de avocatsdaletvenot ! 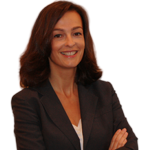 In 2016, Stéphanie Dalet-Venot founded the Dalet-Venot Law Firm. She brings 10 years of experience as senior counsel, following a few years as an associate, within a business law firm especially renowned in the areas of the asset recovery (including internationally) and complex litigation. She was admitted to the Paris Bar in 1995, after graduating from the Bordeaux Institute of Political Studies (1991) and earning a masters degree in Business Law at Paris I University (Panthéon-Sorbonne) (1993) followed by an advanced degree (DESUP) in Law and Legal Practice at Paris II University (Panthéon-Assas) (1994). Stéphanie Dalet-Venot's professional experience has led her to develop her activity around judicial litigation and to appear in court regularly. Based on this experience as a litigator, Stéphanie Dalet-Venot taught both civil and criminal procedure for several years at ENADEP (Ecole Nationale de Droit et de Procédure). Stéphanie Dalet-Venot is bilingual in French and Spanish, and speaks English fluently, and has used it daily in her work for several years. Her language skills allow her to intervene in international litigation and negotiations. She has been a member of the l’Union Internationale des Avocats (International Association of Lawyers) since 2015 and benefits from a network of lawyers around the world.